VW’s bunny makes its third visit. This time as a limited-edition Rabbit trim. 2019 Volkswagen Golf GTI Rabbit Edition. The Volkswagen Rabbit is set to return once again. This time, it isn’t a model name. Instead, VW has chosen to deliver a limited-run Golf GTI Rabbit edition, apparently for the 2019 model year only. With the Rabbit edition on tap, Volkswagen has reiterated its commitment to small cars. The GTI returns with its S, SE, and Autobahn trims in place. For 2019, the Rabbit edition slots between the S and SE. New this year is a slight boost in power to the turbocharged 2.0-liter four-cylinder engine motivating this front-wheel-drive model. The turbo now makes 228 horsepower when fueled with premium grade gasoline, up from the previous 220 horsepower. It still makes 258 pound-feet of torque. Volkswagen gives Golf shoppers a choice of a six-speed manual gearbox or a new seven-speed dual-clutch automatic transmission. The latter is a nod to enthusiasts who might put an emphasis on 0-60 mph times. Although VW hasn’t published those numbers, a dual-clutch transmission typically shaves 0.1 or 0.2 seconds off of the manual’s time. When it comes to sprints, these numbers are critically important. As for the Golf GTI Rabbit, it has LED headlights with an adaptive front-lighting system — the better to see around corners. You’ll also find 18-inch gloss black aluminum alloy wheels, a black rear spoiler, keyless entry with push-button start, Rabbit badging and red-stitched floor mats. Among safety features, you’ll find front assist, blind spot monitoring and rear traffic alert. You’ll also have your choice of eye-popping colors, including Cornflower Blue and Deep Black Pearl. Volkswagen prices the 2019 Golf GTI from $27,595, plus an $895 destination fee. Add $1,100 for the automatic transmission. The Rabbit Edition begins at $28,895, while the SE costs $31,795. Topping things off is the Autobahn model, costing $35,995, which brings in summer tires, dynamic chassis control (adaptive suspension), a 12-way power driver’s seat with lumbar support, and every available driver-assist features. As for the Rabbit name, it was first used in 1975 for the vehicle that eventually replaced the Beetle. Oddly, the Golf name was used from the onset in Europe, but not in the U.S. In 1985, the North American Rabbit became the Golf, a name it stayed with for more than two decades. However, from 2006 to 2009, Volkswagen sought to increase U.S. sales by resurrecting the Rabbit name. That effort didn’t go over too well. Finally, in 2010 this model returned to its Golf roots where it is likely to stay for good. That said, the GTI Rabbit edition may very well stir interest in the Golf as customers are drawn to its special look and features. As for competitors, consider the Subaru WRX and the Honda Civic Si when examining this model. By the way, the Ford Focus ST is no more, while the Hyundai Veloster Turbo is also worth exploring. 2019 Volkswagen Golf GTI Rabbit Edition photo courtesy of Volkswagen of America. Power Up: Ford Focus ST! The next lesson in the School of Speed. Ford Performance, Focus ST style. Tangerine Scream was the perfect name for the tri-coat finish smothering the body of a delicious 2015 Ford Focus ST five-door hatchback tasked with teasing and pleasing me recently. 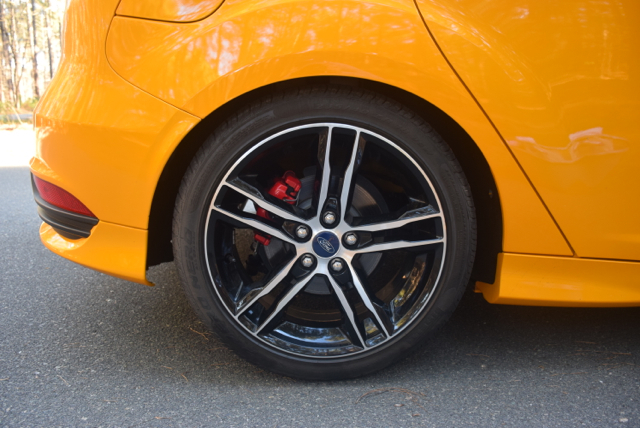 Indeed, the ST’s bright finish served as an exclamation point on a model with more attitude between the wheels than some far more expensive sports cars. If you aren’t familiar with “ST,” then allow me to give you a quick lesson in the school of all things speed. 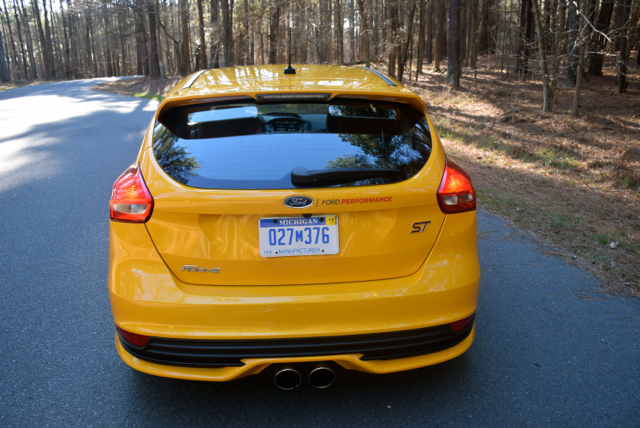 ST is a line of sporty vehicles from Ford Performance, representing the racing arm of the Ford Motor Company. The ST line is currently composed of the Ford Fiesta ST (see my Dec. 2014 review of the same here) and the Ford Focus ST. Moreover, a near ST-like Fusion Sport sedan is due for release in 2017. Both ST models are new to Ford fans in the US, but the line has long been familiar to European fans. North American car buyers now have access to these models because of the company’s “One Ford” initiative: in essence, Ford is now selling nearly all its models across multiple markets. Previously, some of Europe’s best vehicles were held back from the US. Beginning in 2008 that all changed as the Euro-spec Fiesta and Focus were sent across the Atlantic. New ST models followed and now Ford has a pair of hot hatchbacks to segue to the Mustang. 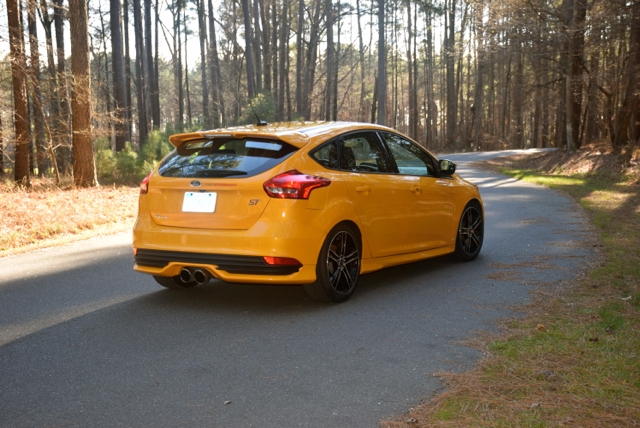 So, what’s the big deal about the Focus ST? Besides its tricked-out visage with special skirting, alloy wheels, summer tires, unique lights and fascias, and eye-popping colors, you also get a pumped-up interior. 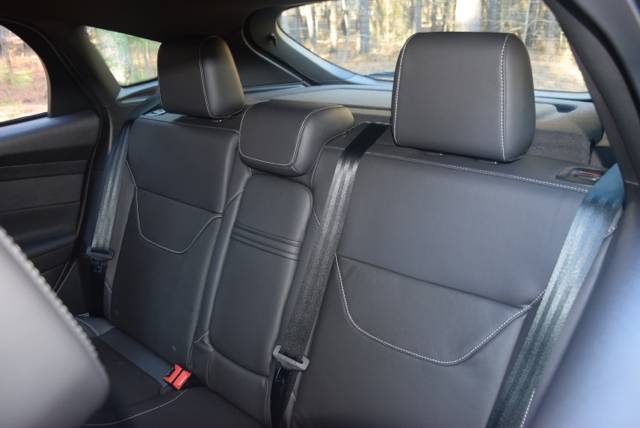 The Recaro seats literally make the cabin, enfolding the driver in a secure embrace. 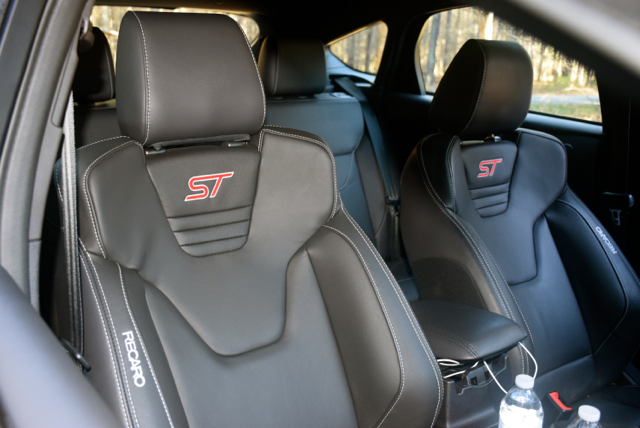 The Focus ST also serves up a thickly padded, leather-wrapped steering wheel with a requisite flat bottom. A bank of three gauges situated on top of the dashboard and at the apex of the center stack displays turbocharger boost pressure, oil temperature and oil pressure information. Further, aluminum pedals, satin chrome door grab handles, illuminated aluminum scuff plates, and available Ford SYNC telematics are among the other stand out features you’ll find. Of course, this model would offer little to truly cheer about unless it came equipped with a manual transmission. The 6-speed gearbox provides a short throw shifter, for quick work up and down the gear range. A USB port sits just fore of the stick, but it was busted out in the test model. In addition, a second port is stuffed underneath the armrest/storage compartment and is better suited to keep your smartphone secure as you power through every curve. Exterior and interior embellishments are fine, but it is what resides under the hood that best defines this model. In this case you’ll find a potent 2.0-liter, Ford EcoBoost engine. EcoBoost is Ford’s engine brand combining one or more turbochargers with direct injection and variable valve technology, in a bid to squeeze more power out of a smaller footprint. Introduced in 2009, EcoBoost is now available across nearly the entire Ford range, giving the automaker an important marketing advantage. 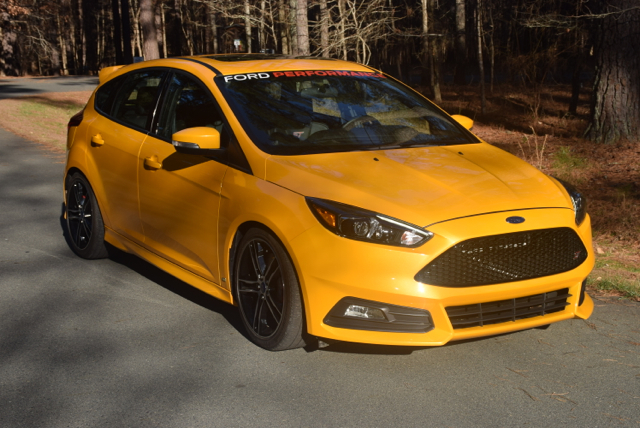 In the Focus ST, the front-wheel-drive compact hatchback certainly benefits from EcoBoost as its relatively light weight (3,223 pounds) and smaller footprint enhance performance. 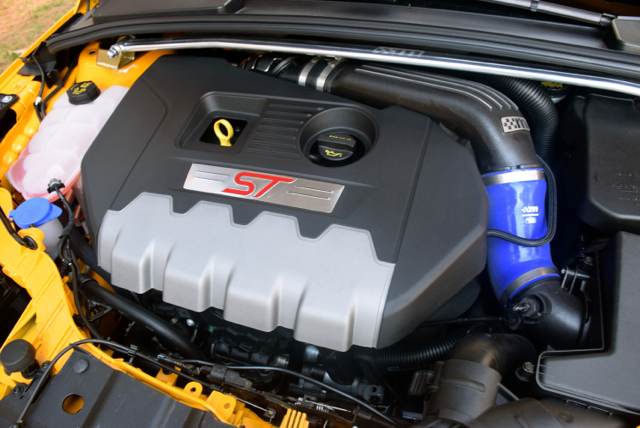 Producing a whopping 252 horsepower and 275 foot-pounds of torque, the Focus ST has what it needs to take on the puissant Volkswagen Golf GTI, long the performance leader in the segment. Which of the two models is faster is a matter of debate, something I won’t address here. The important thing is Volkswagen has a skillful competitor — no other manufacturer has been able to trump the Golf GTI to date. That is, until now. Press the start button, engage the clutch, shift the transmission stick, and you’re ready to commence with an unusual experience. It begins with the sonance of the throaty engine where every decibel of its turbo goodness wafts into the cabin to annunciate its presence. The exhaust system answers in a cacophony of hums, toots and wails, proclaiming to all the pocket rocket’s proximity. You’ll need to grasp the steering wheel firmly with your left hand as you flick the shifter with your right hand while working the pedals — torque steer is present and is supplied in abundance. To the uninitiated, the feeling may be entirely unnerving — why is my steering wheel suddenly shifting from side to side as I zoom down the road? How fast does the Focus ST go? Well, I never approached the upper end of its speed range — 150 mph, but I did take it to my favorite twisty roads to peel out and gauge how quickly it reached highway speeds. With the front tires squealing as I floored the accelerator and made quick work of the clutch and shifter, I found myself topping 60 mph while yet in third gear. That’s just above 6 seconds flat for the diminutive racer and faster than nearly anything else in the small car range. Once you’re up to speed, you’ll need to familiarize yourself with this model’s competence on twisty roads. It’s a quick steering beast with stiffly tuned shocks and excellent grip up front. That’s the confidence you need for curvilinear roads and not something you’ll find in an ordinary hatchback. And the Focus ST is the antithesis of ordinary. If the standard arrangement isn’t enough, a factory supported performance modification package from Ford Performance Parts and Mountune should do the trick. Specifically, the Mountune MP275 performance upgrade boosts engine performance to 275 horsepower and 296 foot-pounds of torque. You also can trick out your ride further by opting for a torque blasting differential, a front strut tower brace, lowering springs and other enhancements that may ultimately add as much as $5,000 to your cost. That’s about $35,000 to get the ultimate in driving dynamics, but still well below the price of a fully optioned Ford Mustang — two very different models derived from the same DNA. What’s my verdict on the Ford Focus ST? Its a heck of a fun driver and a fantastic alternative to established, more traditional models such as the Mustang, Challenger and Camaro. It also gives Ford a strong entry in a segment led by the Volkswagen Golf GTI. Personally, I’m looking forward to the Focus RS’ arrival this spring, a top-of-the-range model that promises to slay yet another segment dragon, this time in the form of the Subaru WRX STI. By then, you’ll be prepared to take your next lesson in the School of Speed. 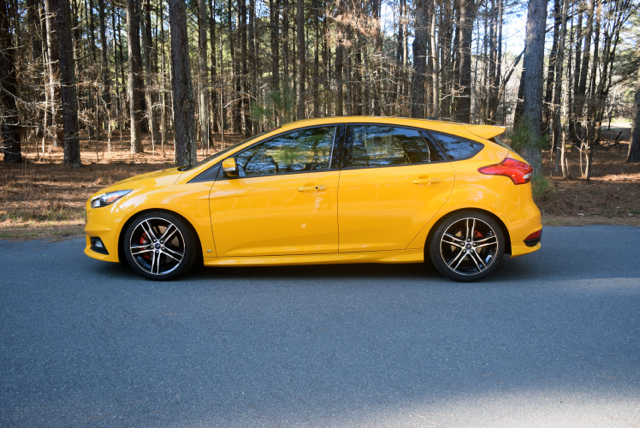 2015 Ford Focus ST photos copyright Auto Trends Magazine.